The colorful Rainbow Eucalyptus is the only eucalyptus variety naturally found growing in the Northern Hemisphere. 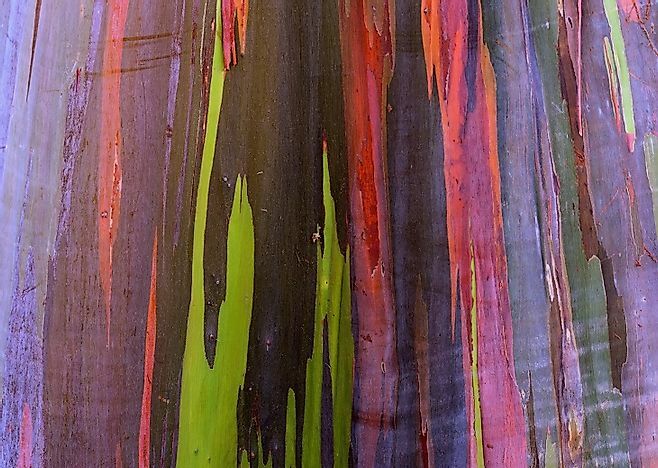 The naturally occurring, multi-colored bark of the aptly named Rainbow Eucalyptus. The rainbow eucalyptus (Eucalyptus deglupta), also known as the Mindanao gum or rainbow gum, is a tall, broad-leaved evergreen tree which grows up to a height of around 200 feet in its native habitats. The trunk of the tree, possessing a diameter of around 6 feet, is noted for its multi hued appearance in summer. The smooth, orange tinted trunk bark peels off in summer, revealing a plethora of colors in the new bark layer, symbolizing the colors of the rainbow. Rows of rainbow eucalyptus trees growing in tandem with their vibrant barks with streaks of green, yellow, red, and orange colors, offers a spectacular sight in summer. However, outside their native range, the rainbow eucalyptus grows to a smaller height and displays less colors. The tree possesses 6-inch long lancet leaves which yield an aromatic powder when crushed and produces small, white flowers during the blooming season. The rainbow eucalyptus belongs to the Eucalyptus genus of plants which comprises an array of flowering trees and shrubs belonging to the myrtle family. The name eucalyptus is derived from the Greek word “eu” meaning “well” and kalýpto meaning “to cover”, referring to the operculum that covers the flower buds of these trees before the blooming of the flower. Blue gum (Eucalyptus globulus), Yellow Gum (Eucalyptus leucoxylon), Rose Gum (Eucalyptus grandis), and River Red Gum (Eucalyptus camaldulensis) are some of the related species of rainbow eucalyptus. More than 700 species of eucalyptus are found of which only 15 species occur outside of Australia. However, many eucalyptus species are cultivated in various parts of the world though they need to be protected from frost conditions. Many eucalyptus species like the rainbow gum, are known as gum trees by virtue of their gum kino, which is exuded from all points of break in the bark of such trees. Though all species of the Eucalyptus genus grow exclusively in the countries of the Southern Hemisphere, the rainbow eucalyptus is the only known eucalyptus species that extends its range to the Northern Hemisphere. The rainbow eucalyptus grows in tropical forests with high rainfall and are found in New Britain and New Guinea of Papua New Guinea, Sulawesi and Seram of Indonesia, and Mindanao of Philippines. For the purpose of cultivation, the tree has been introduced into many other countries like the United States where it is grown in frost free climates like Hawaii, and those in the southern parts of Texas, Florida, and California. The rainbow eucalyptus is cultivated in many parts of the world for its wood and for ornamental purposes. The tree requires a frost-free, warm and wet climate and grows quite fast, reaching a height of up to 5 feet within a single growing season. It is usually grown in places where its vibrant bark is on full display to admirers. The rainbow eucalyptus must always be well watered and protected from frost. Although it can survive an overnight frost, extended periods of frost will kill the plant. Due to its vibrant appearance and aesthetic quality, the rainbow eucalyptus has high ornamental significance and is used extensively to decorate home grounds, ornamental gardens, parks, and fields. The tree also provides excellent shade under the summer sun and emanates aromatic fragrance that soothes the mind. The rainbow eucalyptus is widely used for preparing wood pulp by the pulpwood industry and infrequently used as sources of lumber. Paper, furniture and veneer are some of the products generated from the wood of the rainbow eucalyptus tree. Pulpwood companies in the Philippines often use these trees as the dominant plant species in their commercial plantations.